My Plowboy fixed/free mountain bike represents the concluding phase of a condition known as Singularis Celeritas Febris (singlespeed fever). It started innocently enough with the conversion of a Cannondale geared bike to single speed, progressing via acquisition of a Surly 1x1 singlespeed frameset to peak with the purchase of a dedicated Soulcraft frame. I have ridden singlespeed almost exclusively for the past two years. 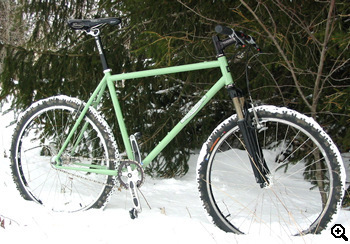 I love the freewheelin' singlespeed thing. But from browsing 63xc.com and talking to friends who ride fixed on the road, I've gotten increasingly interested in trying out my beloved Soulcraft as a fixed gear. So I finally took the plunge. My conversion method might not be ideal, but it was certainly easy. I threaded a Surly fixed cog and generic bottom bracket lockring on the flip side of a standard Surly 1x1 mountain hub. It's threaded for a BMX freewheel on both sides, and differs from a dedicated fixed gear hub only in having a lockring that threads on in the same direction as the cog. I heard feedback from several people who have used this setup successfully before deciding to try it for myself. As an added safety measure, I used blue medium Loctite on both the cog and the lockring. The balance of parts is made up of higher-end stuff from Avid, Chris King, RaceFace, RockShox, Salsa, Speedplay and Thomson. I haven't actually had the chance to ride offroad with the fixed setup yet. (I had just finished converting it when the snow started flying here in Michigan). But I have been riding it on the roads around my house. My first thought--besides "Don't launch yourself over the bars by trying to coast"--was, "Wow, it's really cool to feel this connected with my bike!" I can't wait to get it offroad. There are a few West Michigan trails that I think will lend themselves nicely to offroad fixed riding. There are also some fairly technical trails--log crossings, sketchy rock gardens, etc--that would be downright scary for a newbie fixer like myself... I'll stay off the latter until I build up my skills a little. I definitely plan on exploring more singletrack with the fixed gear setup this spring and summer. The fever rages on! I just purchased a custom Steelman Eurocross 525 cyclocross frame. It has the same Paul Components track fork ends as those on my Soulcraft, and it was built with 135mm rear dropout spacing. This one will also get a fixed/free configuration. Craig Emenaker rides mainly single speed and fixed bikes in Michigan (USA), and also enjoys tandem cycling with his family. Craig runs his own site with articles on the Plowboy and Steelman and on the trails of West Michigan. 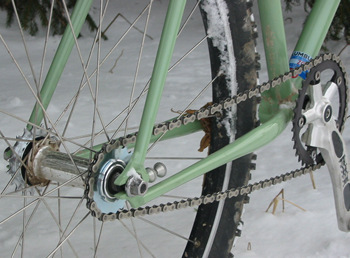 Surly's 1x1 hub is an old fave. The official 63xc.com line is that you need a left hand thread lockring on your hub: you can find a listing of suitable product on 63xc.com's FG hubs listing.